Unifor claims to be the “largest private sector union” in Canada. It would be more accurate to describe them as the largest union-raiding organization in Canada. Unifor now spends more time and money raiding other unions than they do organizing un-organized workers. Almost 60% of “new” members in the first 3 months of 2018 came from raiding. 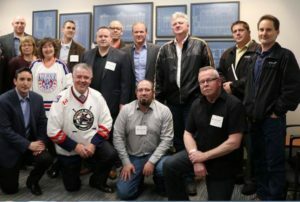 The proof is in the April 4 issue of Unifor’s online publication, Unilink. Unifor brags that they have signed up 1,605 new members, but 919 of those “new” members were actually hotel workers who had belonged to UNITE HERE 75 in Toronto. Unifor targeted 24 hotels represented by UNITE HERE and were only able to win votes at 5 of them. Those 5 units have an average size of 184 workers. That is an abject failure. Jerry’s incompetence at raiding is the only consolation here. 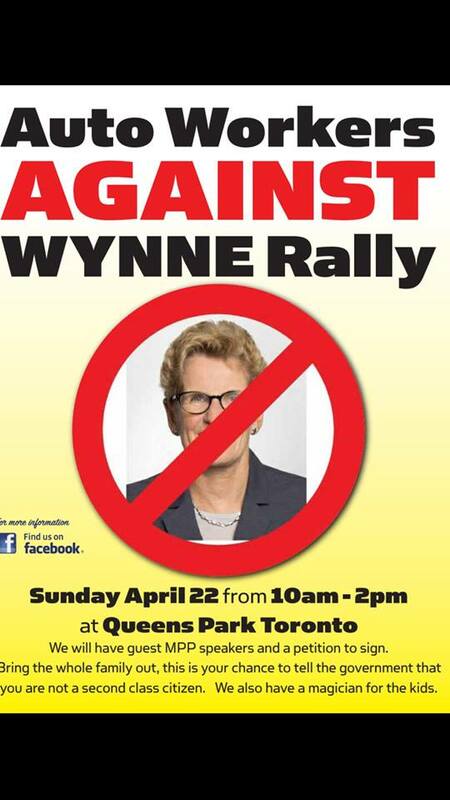 But an even bigger failure is the record of Unifor at organizing the unorganized. In the same three months, across Canada only 686 workers from 10 locations joined Unifor. The average unit size is under 70 workers. All but one of those certifications were in Ontario and Quebec. Unifor’s record in the other 8 provinces and 3 territories – one unit of 85 workers. How is it possible that Unifor, with 18 full-time reps in the Organizing Department (all on 6-figure salaries), and an annual organizing budget of $10 million, can produce such dismal results? Is anyone in the corner offices at Unifor headquarters asking themselves why workers don’t want to join them? In all of 2017 they organized 3,279 workers. The 686 for the first quarter of 2018 is an even lower annual rate of 2,744. 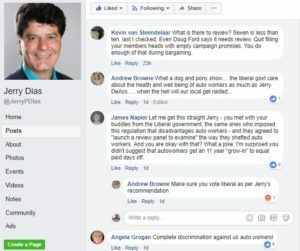 Could this be the reason Jerry Dias is willing to divide and undermine the house of labour in Canada in order to raid unions that are part of the Canadian Labour Congress? Shane Wark (left front) one of Jerry Dias’ assistants, cozying up to the Liberal Ministers of Labour and Transportation, along with some of Jerry’s Raiders. 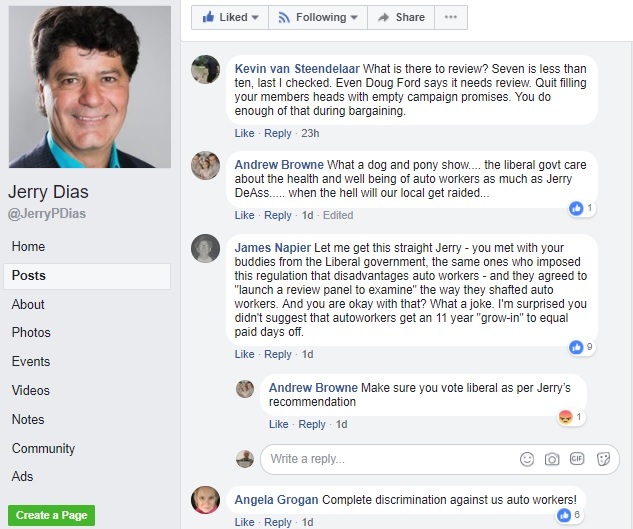 Autoworkers show their contempt for Jerry Dias’ post bragging about meeting with the Liberal ministers of Labour and Transportation and getting a promise of a “review panel”. exemption”. Not a very impressive accomplishment – but that is what happens when you are not willing to fight. Of course, Jerry’s Facebook post where he made this hollow boast, attracted a slew of sarcastic, angry comments from real autoworkers. We have posted a screen shot of some of them, in case Jerry’s social media handlers ever get around to deleting them. 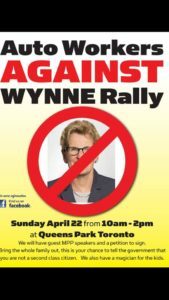 Unlike Jerry, we hope thousands of autoworkers, both union and non-union, show up at Queen’s Park on Sunday, April 22 at 10 am to demand fair treatment for all workers under the Employment Standards Act. 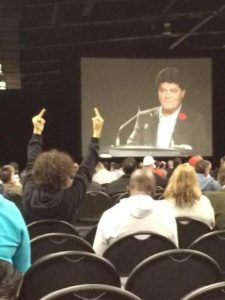 Jerry Dias leadership has been a disgrace and a disaster since he was anointed. He has completely ignored the long suffering GM retirees among many other dues paying members. He is the worst President I have seen in my 41 years membership in UAW/CAW/Unifor. You were right about Jerry’s social media handlers deleting angry comments from disgruntled autoworkers! They have taken many off to keep others in the dark.